The 14-Week Fitness Challenge - Are You In? In 14 weeks time (June 2nd, 2012), Mrs Scot and I are going on our honeymoon. I want to look better for the beach. In about 20 weeks time I am organising a ‘challenge’ for charity which is going to be extremely physically demanding. More about this later. To get a new personal best (P.B.) in deadlift, benchpress, squat etc. Whatever your goal may be, choose something and commit. We are going to set ourselves an end goal which can be broken down into ‘mini-goals’ which we can review on a weekly basis. This will give us a chance to discuss progress and help each other out with any setbacks. Running/Cardio 3 times per week. Eat brown/wholemeal toast in the mornings with my poached eggs and also if I have a baguette at lunch. Continue to eat bananas/nuts/flapjacks as ‘small meals’ throughout the day. Row 2500m at two sessions, 30 min jog at one. While the above list does not cover all the exercises that I will carryout, it highlights those which count towards my end goals. Reflecting on the above list; I think that I will struggle most with the fizzy drinks aspect as I often need a sugar-kick mid-afternoon. Hopefully by drinking lots of water this will help keep me hydrated and more attentive. I will keep you all updated on the progress. I want to know your end goals and your Mini-goals for the week ahead…. This is a great idea! I’m pretty good at sticking to my cardio routine, but I need to get more into strength training. And my mini goal for this week would be to do a crap ton of research about weight bearing exercises, and try some of them out during 2 non-cardio work outs. I’m glad you are in! 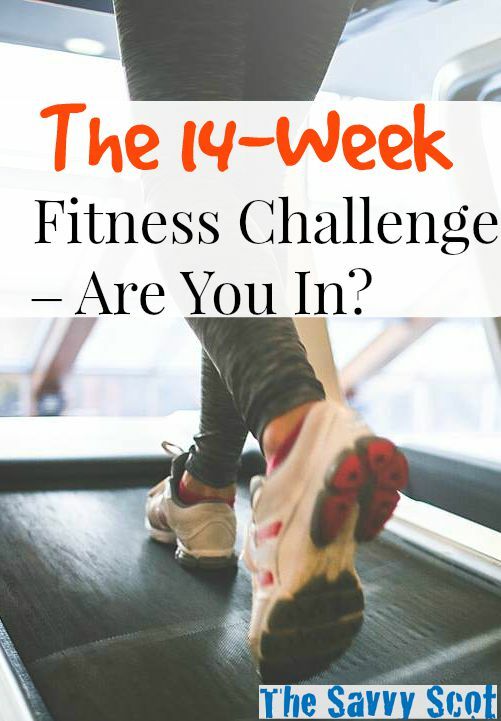 savvyscot recently posted..The 14-Week Fitness Challenge – Are You In? In 21 weeks, (July 15) I am completing my first Half Iron distance triathlon (1.2 mile swim, 56 mile bike, 13.1 mile run). I’m following a training plan, and working to build my endurance on the bike (the swim and the run are good). My weight and nutrition are under control, although staying away from sweets is still a challenge. So, for your 14 week mark, I want to be able to ride my bike for 200 minutes, hopefully being able to maintain an average speed of 16 miles per hour for the ride. That would give me a training ride of just over 50 miles. My only weight related goal during training is to not gain any weight. And I need to add strength training, so I will commit to either doing weights at the gym or at home a minimum of 1 time per week. Finally, I’m going to try to get to yoga at least 2x per month. The stretching is good for me! Great challenge, I love it! Hey Kris – thanks for joining! That is very impressive that you are training for a half iron man. I have always wanted to do one – you have given me some motivation! What is your current nutrition plan? I’m not following a formal nutrition plan right now – having lost a lot of weight, I’m used to tracking my food from a calories perspective! But, everyday eating consists of lean protein, lots of fruits & veggies, whole grains, and limited dairy. I consume between 1500 & 2200 calories a day; more on really hard training days. About 60% of my calories come from carbohydrates. I find I have trouble digesting protein powders, so I don’t use supplements. We’ll see ifI wind up eating more as training picks up! Interesting – Do you make an effort to eat complex carbs though? Hey Nick – perfect timing! Would be great if you post up some goals too. The honeymoon is not until June. We figured that spending 2 weeks in Thailand would be pretty hard to beat – so we postponed it for 5 months 😉 Kinda got 2 for 1 out of that too! 1. Weigh 145 pounds by June 2nd. 2. Exercise at least 39 times between now and June 2nd. 3. Stay on the Weight Watcher Points Plus plan strictly every week too (250 points or less a week). Some good goals – can you explain briefly what the ww plan is? I will publish a post tomorrow detailing all the contenders who have signed up! I think that’s enough for now…great challenge! Hey Khaleef! Some great goals there – 50 workouts is a decent target! Welcome aboard! I will add you in later today 🙂 – Good goals and good luck! The water one is a big thing for me. So far so good, but it is such a change of habit!